Lake George Bike Rentals delivers bicycles to tourists and residents in the Lake George region. As a brand new business, they lacked an online presence and needed a website so that people could discover their bike rentals and make a reservation online. To help establish a strong internet presence, they contacted Mannix Marketing for a custom designed, SEO friendly attractions website. As visitors arrive on the Lake George Bike Rentals website, they’re greeted by a clean, modern, welcoming design that incorporates fun and lively colors, photos of families and vacationers enjoying their bikes, and strategic calls-to-action encouraging visitors to view bike rentals and make a reservation online. Visitors can choose from a unique selection of bicycles for kids and adults. Bicycles are displayed in a visually appealing format along with a brief description so that visitors can find and select the bike that best fits their needs. When visitors are ready to make a reservation, a user-friendly online reservation system makes it easy to quickly and easily place their order directly through the website. Of course, customers need to know the best trails for exploring the Lake George region by bike. The “Trails & Routes” section features a list of popular bike trails in the Lake George, including the Warren County Bikeway, North Creek Ride, and other exciting bike paths. Built with SEO best practices, this SEO friendly website is easy for travelers to discover online when searching for “bike rentals in Lake George, NY” and related keyword phrases. 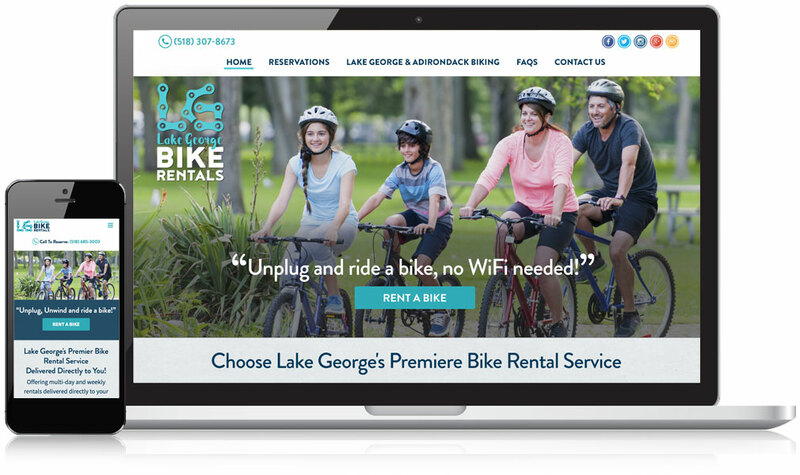 In turn, this helps Lake George Bike Rentals get found online and bring more potential customers to their website! The Team at Mannix Marketing is a pleasure to do business with, and I recommend them to anyone who wants to get found on the web.